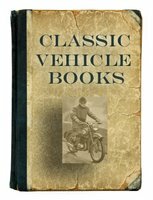 Auburn car books cover the history of Auburn automobiles and the association with Cord and Duesenberg. Several Auburn manuals, historic sales brochures and magazines are available. Auburn was a brand name of American automobiles produced from 1900 through 1936. 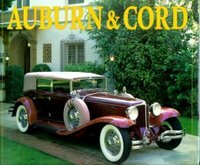 Auburn & Cord by Lee Beck & Josh Malks (1996) chronicles the history of one the automobile's greatest independents. Illustrated by more than 200 historical photographs collected from museums and private collections. The book illuminates the glory years of the small Indiana company that battled the giant automakers and left an indelible mark on the industry. Auburn Cord Duesenberg Festival Posters by John Souder (2006) contains full-colour reproductions of Souder's twenty-six posters for the ACD Festivals from 1981 to 2006. Auburn Motor Cars by Auburn Automobile Company (1928). 'Inside Story of Auburn' on front cover, 'The Product' broken down by components, Auburn plants centerfold, body types (roadster, cabriolet, sedan, sport sedan, speedster, and phaeton sedan), specs on Models 115, 88, and 76, history of the company, balance sheet for 1927 and many illustrations. Road & Track on Auburn Cord & Duesenberg 1952-1984 (1987). A collection of contemporary articles covering: Classic tests, Design, Specifications, Salons, Driving impressions, History, Auburn, 851, 852, 866, Cabin, Speedster, Cord, 812, Coupe, L-29, 812SC, Sportsman, Duesenberg, Indy, J, Coupe, J2, SJ and Replica. Auburn Beauty Six Original 1923 Sales Folder. 'The New Silent Sedan'. Large full side view of their latest model. 'Here it is - the triumph of long experience in automobile manufacture and coach craftsmanship!' Inside, seven photos of front and rear compartments, including jump seats and silk window shades, window lift, rear view and three-quarter front view. On back panel, '11 Reasons Why the Auburn Sedan is Silent', with specifications. A stylish item of this much-admired marque. Advertising Blotter (1956) Showing a bronze-orange Auburn Speedster Model 160. Sample from manufacturer of advertising and sales promotion novelties. Cars & Parts: December 1969, Volume 13, No.3 (1969) Features the 1934 Auburn as Car of the Month. Original Garage Charts Showing electrical and wiring details for 1925-26 Auburn 6-Cylinder, 1926 Auburn 4-44, 4-Cylinder, with 1925-26 Auburn Model 6-66, 6-Cylinder, 1920-21 Auburn Six Models 6-39 and 6-54 and 1923 Auburn 6-42, with 1923 Auburn 6-63. 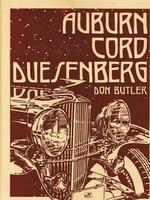 More Auburn car books can be found combined with Duesenberg and Cord car books.